Protect Yourself in the Streets, Purse/Briefcase/Backpack, Door or Window, Laptop Computer! 1) Personal Alarm- you can carry it in a purse or pocket or attach it to your belt using the clip on the back of the alarm. In an emergency pulling the cord will activate the 130 DB alarm and flashing light. The alarm and light will draw attention to the situation, scare off a would-be attacker, and summon help. 2) Purse/Briefcase/Backpack Alarm- when the cord is clipped to your belt or wrapped around your wrist and the alarm is placed inside your purse, briefcase, or backpack, the alarm will sound if someone attempts to take it from you. 3) Door or Window Alarm- the personal alarm can be instantly converted into a door or window alarm using the included door clip accessory. Opening the protected door or window will activate the alarm and flashing light to scare off a would-be intruder and alert you to the attempted entry. 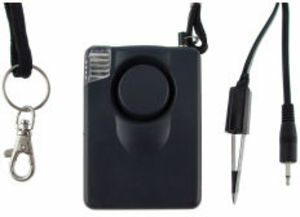 4) Laptop Computer Alarm- the door clip accessory mentioned above can be used to protect a laptop computer or other valuable property. Once the door clip accessory is placed underneath your property anyone picking out that object will activate the alarm and flashing light. Unit operates on one 9 volt battery (not included). Measurements are 3" x 2" x 1"